In the early morning hours of September 1, 1939, Germany invaded Poland. At 11:15 AM on September 3, 1939, England declared war on Germany. In between those two world-changing events, something happened that went unnoticed by almost everyone in the world: the SS Athenia left Liverpool, England and sailed for Montreal, Canada. The Athenia had departed Glasgow, Scotland a day earlier, stopping at Belfast, Ireland and Liverpool to pick up more passengers. One of those passengers was Eleanor Crowley. Eleanor had been married to Daniel Crowley for less than 10 months and was in England to fulfill family obligations around the death of her aunt. She had managed to work in a visit or two to see other relatives — with the impending war she didnt know when, or if, she would see them again — but now it was time to head home and be reunited with her new husband. News of the invasion of Poland had certainly caused him some concern for her safety. By the evening of September 3, the ship was about 250 miles northwest of the island of Inishtrahull, Ireland. Word had reached them of the declaration of war and the mood was somber. At about 4:30 that evening, the Athenia was spotted by a German U-boat, U-30. The captain of the U-boat, Fritz-Julius Lemp tracked the ship for three hours. He recorded that the ship was sailing without its lights on and sailing in a zig-zag course. Based on these factors, plus the location – which was outside typical shipping lanes – Lemp concluded the ship was a troop carrier. Lemp fired two torpedoes at the Athenia. One struck home. The torpedo ruptured the bulkhead between the engine room and the boiler room. The engines stopped immediately as icy ocean water poured in through the enormous hole. The Athenia was dead in the water and began to list. The radioman began to broadcast SOS messages giving their location and situation. Several nearby ships altered course to help. The crew began to load passengers onto the life boats, but it was not an orderly process. Panic gripped the ship, passengers and crew alike. They had no idea if there were more torpedoes to come; how long the ship would remain afloat; or even if there would be enough lifeboats for everyone. About 50 people had been killed by the explosion and many more were injured. Later, reports were filed by some passengers that members of the crew were looting cabins after they ordered the people to the lifeboats. Aunt Eleanor was put in a lifeboat along with about 50 other people. But even that did not go smoothly. One man fell out of the lifeboat and hit the water next to Aunt Eleanor. She reached over and grabbed hold of him but she was not strong enough to lift him back into the boat. Afraid that she might lose her grip, or worse, get pulled in too, she screamed for help. Even as the men near her reached out to help she clenched her fists tighter so as not to let him slip away. Finally, he was in the boat and she relaxed her grip. They both survived, but unfortunately, Aunt Eleanor’s nails did not. She had gripped so hard into his clothes that her nails were broken! 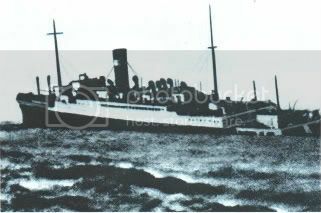 Their lifeboat drifted near the hulk of the Athenia for a couple of hours until a Norwegian tanker, the MS Knute Nelson, arrived and transferred the passengers aboard. The Athenia sank about 14 hours after being struck by the torpedo. The Knute Nelson picked up a total of 450 survivors and dropped them off in Galway, Ireland. Uncle Dan did not learn Aunt Eleanor’s fate until a list of survivors was published on September 6. I can not even imagine how long those three days were for him. Aunt Eleanor finally made it back to the US on September 27 aboard the SS Orizaba. She had lost everything except the clothes she wore, but she survived. This entry was posted on Saturday, May 30th, 2009 at 16:19 and is filed under Crowley Side. You can follow any responses to this entry through the RSS 2.0 feed. You can leave a response, or trackback from your own site.